Happy Tuesday!! I am feeling so blessed after reading how much you all enjoyed my post yesterday! Thank you all so much. So....I have been waiting to find a new fabric supplier for the shantung sateen and I have! 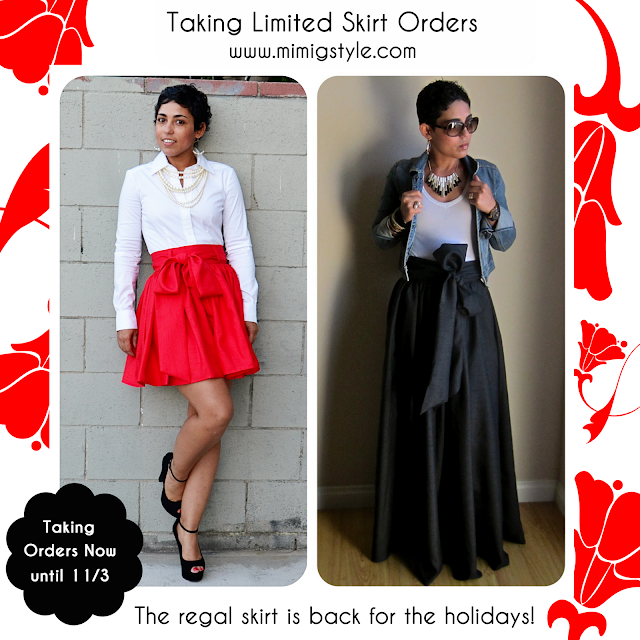 so because I have been filled with holiday glee (and I found a new supplier and seamstress) from now until this Saturday I am going to take a limited amount of orders on the Regal Skirt w/ Sash both short and long!! Skirt is available in the size listed below in RED or BLACK Shantung Sateen. I am offering both the short and long so make sure to choose the correct buy now button. Skirt has 4 belt loops a long sash and a back zipper. These do not have side pockets. Based on the smallest part of your waist / Length of Long Skirt: 43" / Length of Short Skirt 23"
There are no refunds or exchanges as I am not a retailer, choose your size correctly. Mimi, I want to CRY. I abosolutely LOVE both of these lengths, however, I cannot purchase either of them at this time. So sad that I'm missing this opportunity. They are ABSOLUTELY gorgeous though. Get it Mimi! I love it! This was one of my fave outfit posts ever! Love the red skirt.. I wish I could afford it b/c the long skirt gives me so much life....love your style!!! Oh no, didn't realize these skirts won't have pockets. Will you ever make them with pockets? WOW...I wish I could afford the long one. Just found out that I am being laid off so I can't really justify spending this much money even if I could wear it on interviews!! Thanks for the opportunity. YAY.......I was introduced to your blog for the first time when I saw this amazing skirt on FB, I fell in love. Now I get my very own in time for Christmas!!! Thank you for giving us another opportunity to own this FAB skirt once again!! Congrats on your smoke quitting, my quit day is Friday, 11/2/12. I just wanted to say I really love your blog, and so glad that you share what you do and so glad you are trying to keep it real. That's what keeps me coming back for more, your style, your helpful attitude and the fact that there is no shaming or blaming. You are a gourgeous person outside, but your blog shows you are so very gorgeous on the inside also. SO thanks for sharing yourself with us. I can't wait to read what's next! That skirt tutorial is so great! I've made two of them so far from two different types of fabric that I've had laid up for a few years. I shortened the skirt to slightly below the knee...something that was appropriate for church pulpits and directing choirs, you know. I received several compliments. Thanks so much...keep up the great style! Hello Mimi, First I want to say I love your blog. You are so talented. I have been waiting for the option to order this skirt for a while. But, I missed this recent opportunity due to the Hurrican that affected New England. I live in CT and haven't been able to check your blog since Hurrican Sandy left my area without power. Is there anyway you can allow us to order this skirt again? I really am begging you. But, I understand if you're completely booked. I can not believe I missed this again! Lord have mercy! When will you be taking orders again? These skirts are absolutely gorgeous! You certainly have a talent and I would love to buy one of the long ones for a change on cocktail attire.. please let me know ASAP.